This is part of a snapshot taken in Rome in 1932. 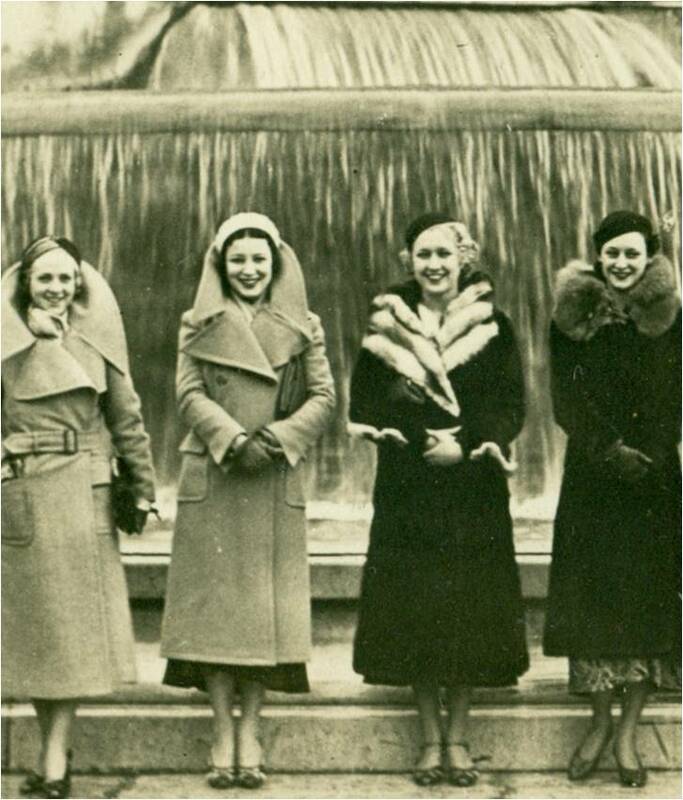 Helen, the subject of my book, River of January stands above wearing the white fur-collared coat. Posing next to her, in the white cap is dancer, Carmen Morales, another member of the “American Beauties,” an American ballet company. The two girls met when both were cast in this troupe booked to dance across the cities of Europe. They remained the closest of friends until Helen’s death in 1993. I have perused countless pictures of Helen’s European tour, closely, (close as with a magnifying glass) the faces of her fellow dancers. And I have decided that of all the girls in the show Carmen, next to Helen of course, was a classic American Beauty. From the little I could find on the internet Carmen was born in the Spanish Canary Islands around 1914, and came to the US where her father had business interests. She trained in ballet, and after an audition was booked to tour with dance mistress, Maria Gambarelli. On the ship’s crossing to Le Havre the girls fused together into a solid little unit, and to trouble one meant facing the wrath of all. During their travels, Carmen met a fellow American dancer, Earl Leslie and the two fell in love. Earl and Carmen soon married in Marseilles, and left the show when Earl received a better offer. A German businessman wanted him to manage a string of nightclubs out of Berlin. They took the job to give their new life together a chance. But history was conspiring against Carmen and her new husband when Nazi authorities harassed the two and pressured them out of the country. That was in 1934. The couple again joined their old dance company, but by that point Helen had returned to New York. Meanwhile Earl, Carmen and the rest of their company signed contracts to play in Argentina into 1935-36. It was in Buenos Aires that Earl Leslie began an open love affair with another dancer and broke Carmen’s heart. Carmen returned to New York, divorced Leslie and moved to Los Angeles to resume her show business career. Her big break came in 1940 when she was cast by director John Ford to play in “The Long Voyage Home,” starring John Wayne. I’m not sure how many films Carmen made, but she quickly fell into a type-cast, that of the femme fatale–a far cry from her sweet, sensitive nature. Making her home in Sherman Oaks, California by the 1950’s, Carmen began the transition to television. Well into the 1960’s she appeared in minor roles on a number of prime time dramas, still taking the time to step on local stages for live productions. Through all those decades, Carmen and Helen remained great friends. If Helen didn’t travel to Los Angeles for a visit,Carmen flew to Miami. My husband recalls the fun his mother had entertaining her good friend, sitting around the little kitchen table, drinking bourbon on the rocks, jangling charm bracelets emphasizing the light spirits, and smoking cigarettes. I am not sure when Carmen died. I don’t know if it was before or after Helen. But Carmen truly deserves to be remembered for her own journey through the twentieth century. She lived an epic life and had stories to tell. Sadly we will never hear them. Except for those few with an encyclopedic knowledge of film, Carmen Morales has been left to disappear into the past. So, when you hoist one tonight, make the toast in the memory of a real American Beauty, the lovely Carmen Morales. Gail Chumbley is the author of River of January, available now. This entry was posted in Biography, history, Memoirs, River of January, Writing and tagged Carmen, Carmen Morales, dance, Helen, John Ford, Long Voyage Home, Los Angeles, new york, United States.